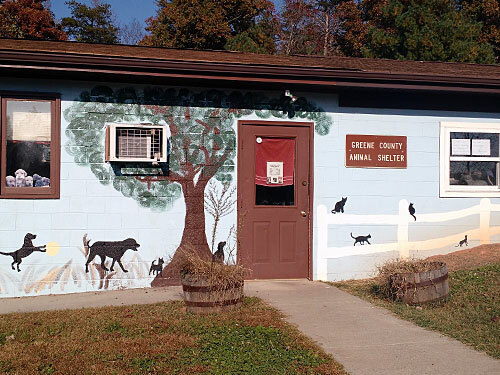 The Greene County Animal Shelter operates under guidelines from the Commonwealth of Virginia to temporarily house stray or injured animals, provide for adoption of as many animals as possible and to humanely follow procedures for euthanasia for unwanted animals. The Shelter strives to encourage, promote, and preserve responsible pet ownership and to prevent any form of cruelty to animals. 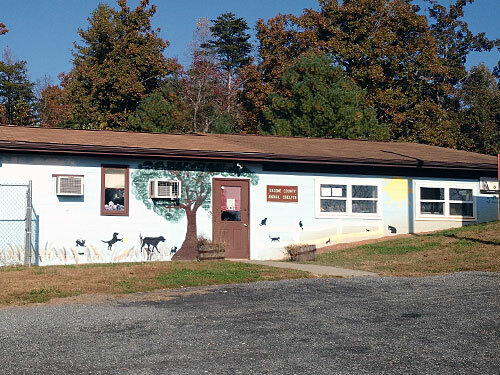 The Greene County Animal Shelter of VA is a small rural shelter trying to save the lives of dogs. We strive on donations of others, whether it be dog food, dog treats, dog toys, collars, leashes, towels, blankets or cleaning supplies such as bleach, pin-sol, dish detergent, and laundry detergent. You can also help by having a dog spayed/neutered by donating to the spay/neuter fund of The Greene County Animal Shelter. You can mail checks to P.O. Box 358, Stanardsville, VA 22973, please note to put the spay/neuter fund in memo. We appreciate any and all donations..
We are located at 37 Jeri Allen Way, Ruckersville, VA 22968. There are 2 seperate organizations in one building. The Greene County Animal Shelter is located on the left side of the building.